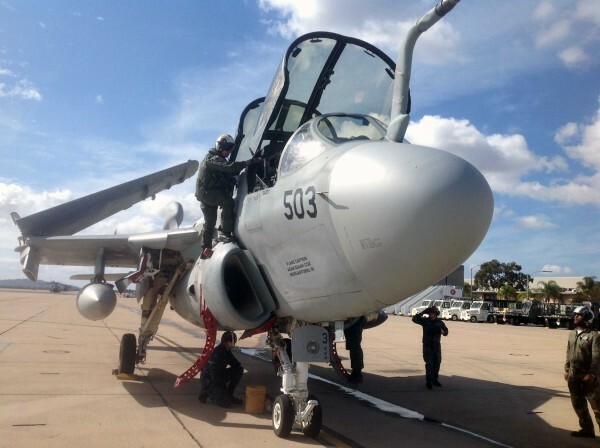 The Flying Leathernecks Aviation Museum and Historical Foundation at Marine Corps Air Station Miramar in San Diego, California has just taken delivery of a Grumman EA-6B Prowler electronics warfare aircraft. 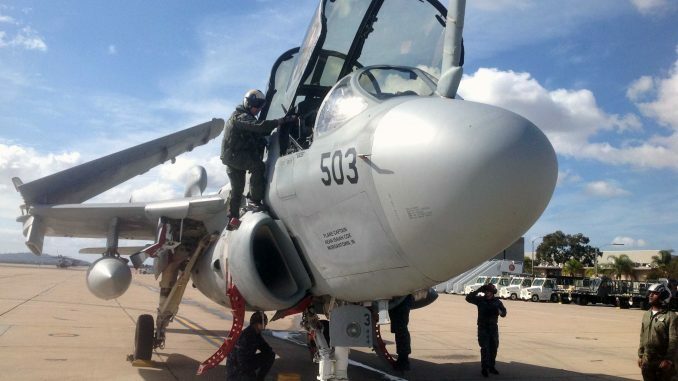 Based upon the airframe of the now-retired A-6 Intruder, the Prowler started service in the early 1970’s and is still active in small numbers with both Marine Corps and Navy squadrons. The introduction of the Boeing EA-18G Growler (a modified version of the F/A-18F Super Hornet), has seen Prowlers slowly being retired as their successor enters service in greater numbers. A few Prowlers have made it to museums. The Museum’s Prowler, Bu.No.161882, flew to MCAS Miramar on February 4th. Her US Navy crew from VAQ-131 “Lancers”; Lt James “Tung” Dobbs, Lt Mark “Haiku” Hahn, Lt Frank “Wuta” Willis, and Lt. Ana “Gazer” Brown brought the Prowler down from their base at NAS Whidbey Island, near Mt.Vernon, WA. VAQ-131 has just recently deployed for their last cruise as a Prowler unit, before they begin transitioning to the Growler early next year. NAS Whidbey Island is the sole remaining land base for US Navy Prowlers, while MCAS Cherry Point in North Carolina is where the last Marine Corps squadrons are based. Bu.No.161882, while serving out her final posting with the US Navy, also served with US Marine Corps squadrons; VMAQ-1, VMAQ-2, VMAQ-3 and VMAQ-4. Staff and volunteers at the Flying Leathernecks Museum are currently preparing her for display, and will repaint the Prowler in VMAQ-3 “Moon Dogs” markings. The museum will be unveiling their new prize at a public ceremony at 2pm on February 28th, 2014. It will be the fiftieth aircraft on display at the museum, which includes such rare delights as a Chance-Vought F4U-5N Corsair and Douglas SBD-1 Dauntless. 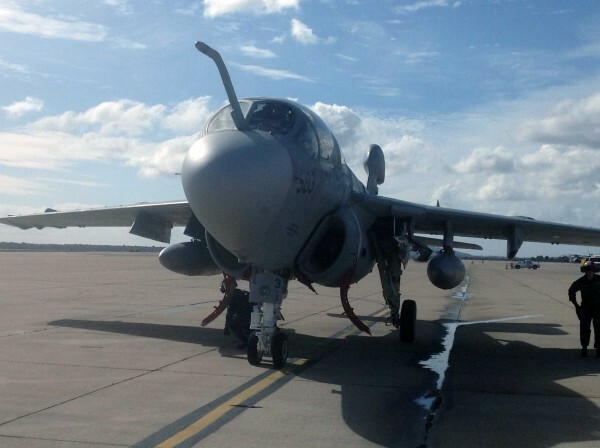 For those interested in attending the Prowler’s unveiling, or simply visiting the museum, its location is at MCAS Miramar, T-4203 Anderson Avenue, San Diego, CA 92145-0316. The museum is located directly across the street from 8604 Miramar Road. For directions from I-15, proceed west for 1.3 miles and turn left into the parking lot. If approaching from I-805, proceed east for 3.9 miles and turn right into the parking lot. Look for the American and Marine Corps flags on the fence. 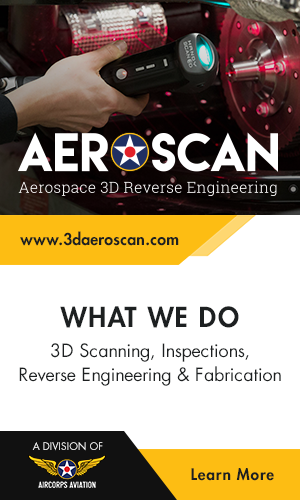 About the Foundation: The Foundation actively supports the operation of MCAS Miramar Command Museum (Flying Leatherneck Aviation Museum) located on MCAS Miramar. They provide volunteers to support day-to-day operations as well as financial support to supplement the limited DoD budget. For more information, please visit www.flyingleathernecks.org. About the Flying Leatherneck Aviation Museum: The Flying Leatherneck Aviation Museum (FLAM) has undergone a rigorous certification process and is one of only three certified Marine Corps Command Museums. The FLAM is the only museum in the world dedicated to the primary purpose of preserving US Marine Corps aviation and boasts a collection of more than forty vintage aircraft, a library with extensive research materials, photos, video, valuable memorabilia and artifacts.